The Hepworth Wakefield is one of the UK’s major art galleries, designed by award winning British architect Sir David Chipperfield. It is a highly sculptural building constructed in pigmented cast concrete and situated at the heart of Wakefield’s historic waterfront on the River Calder. The gallery celebrates and explores the region’s heritage as the birthplace of modern British sculpture through the achievements of two of the most important artists of the twentieth century, Barbara Hepworth and Henry Moore. They both were born and grew up in the Wakefield district. The Hepworth Wakefield offers access to world-class art and a new home for Wakefield’s major art collection and contains iconic works by Hepworth, Moore and their contemporaries. 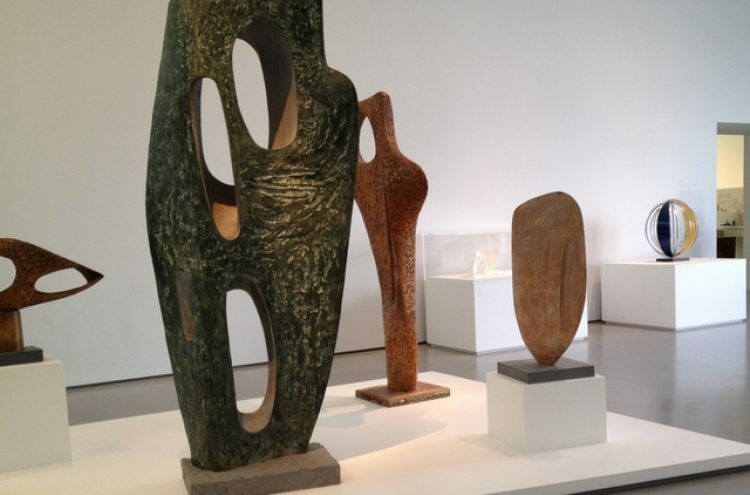 The Hepworth Family Gift of 44 full size prototypes in plaster and aluminium of works Hepworth executed from the mid-1950’s to the end of her career is on permanent exhibition. Centrepiece of the Gift is the aluminium prototype sculpture ‘Winged Figure’ 1961-63 which was commissioned by John Lewis Partnership. Current Visiting Exhibitions are: – British Sculptors as Printmakers, A Greater Freedom: Hepworth 1965-1975, and Plasters: Casts and copies over a 300 year period and Hepworth in Yorkshire: Her Early Years. After refreshments on arrival at the Hepworth we will have a Guided Tour of the Galleries. After our Guided tour we will depart from Wakefield to our second venue Temple Newsam on the outskirts of Leeds. Temple Newsam is one of the greatest historic houses of England, the birthplace of Lord Darnley, husband of Mary, Queen of Scots and sometimes called ‘The Hampton Court of the North’ A four-sided courtyard was completed around 1520 but later fell into disrepair until it was rebuilt as the three-sided courtyard house we see today. Descendants of Sir Arthur Ingram lived in the house for 300 years and in 1922 the mansion and 917 acres of gardens and parkland were sold to Leeds Corporation to secure the future of the house. The house was developed as an art museum, building up superb collections of paintings, furniture, silver, ceramics and textiles. Original treasures are continually being returned to the house and the house has over 40 fully restored rooms. Following our Guided Tour of the house, Tea/Coffee and Cake will be provided before our departure for home. Please bring a packed lunch with you or you will be able to purchase lunch in the Café situated in the Stable Block of Temple Newsam. Cost is £35.00 per person. The price includes: Return coach travel from Lytham St Annes; refreshments and a guided tour of The Hepworth; a guided tour of Temple Newsam, Leeds; and refreshments and cake before departure home.